The project is being executed under Arunachal Package of Special Accelerated Road Development Programme for the Northeastern region (SARDP-NE). Dhola-Sadia bridge is 3.55 km longer than the Bandra–Worli sea link. For engineers working on the country’s longest river bridge project connecting Dhola and Sadia in Assam, the mighty Brahmaputra has emerged as the biggest challenge. The river keeps altering its course, spanning from 0.5 km in winters to 12 km when it floods during monsoons. There are two cranes the team is yet to recover from the river bed — which serves as a grim reminder of the flash floods which washed out the construction site in 2012. In fact, it is this ever-changing course of the river which forced the team to plan a 9.15-km bridge, which is a good 3.55 km longer than the sea link operational over Mahim Bay in Mumbai. Due to recent floods, the level of approach roads being developed had to be raised. Flood banks have been provided on both sides of the river, a few kms into the land side. “Last September, it was observed that floods were contained by the flood banks. But the portion of the road embankment between the flood banks and the river was cut by heavy floods at many locations. These high water levels occur due to insufficiency of cross drainage provided in the design envisaged in the project bid,” Surya Raj, chief manager, Navayuga Dhola Infra Projects Pvt Ltd said. The concessionaire — Navayuga Dhola Infra Projects Pvt Ltd — now is looking at putting in place sufficient cross drainage network for facilitating easy passage of flood water and protection of road and structures. The concessionaire has managed to complete 75 per cent of the physical work at an expense of Rs 725 crore since the date of appointment in June 2011. The Rs 876 crore Brahmaputra River Bridge Project being executed on Build, Operate, Transfer (annuity) basis is now scheduled for commissioning in the current financial year. The concession period is of 17 years, which includes four-and-a-half years of construction time. The Ministry of Road, Transport and Highways (MoRTH) has extended cash support of Rs 592 crore. The project is being executed under Arunachal Package of Special Accelerated Road Development Programme for the Northeastern region (SARDP-NE).The scope of the work includes the construction of a 12.9-metre wide bridge along with connecting roads of 16.65 km. 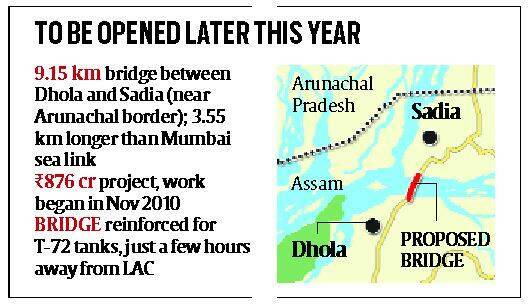 The project highway is a new alignment on Dhola side and single lane road on Sadia side.